Italy; Middle 15th Century. Latin Text; Rotunda or Round Gothic Script, square rhetorical neumes. 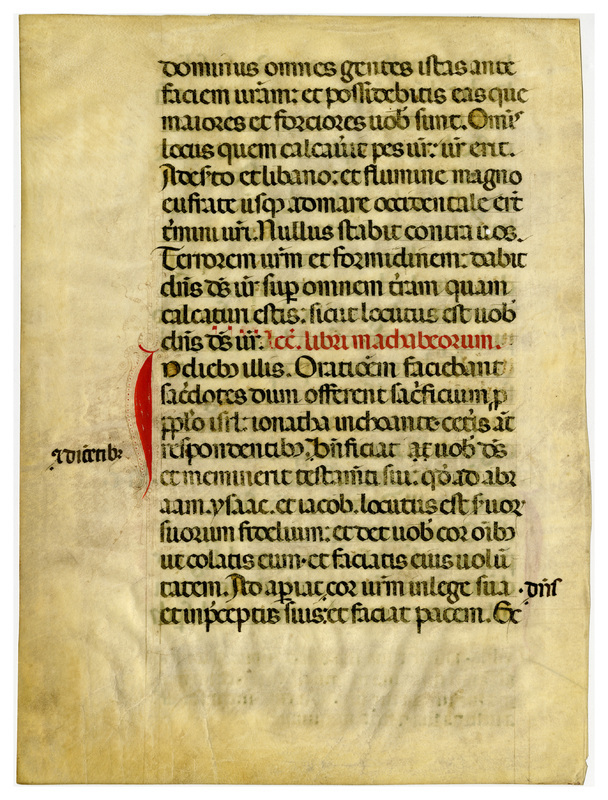 Epistolaries are among the rarest of liturgical manuscripts. Their text consists of the Epistles and Gospels with lessons from the Old Testament for particular occasions. 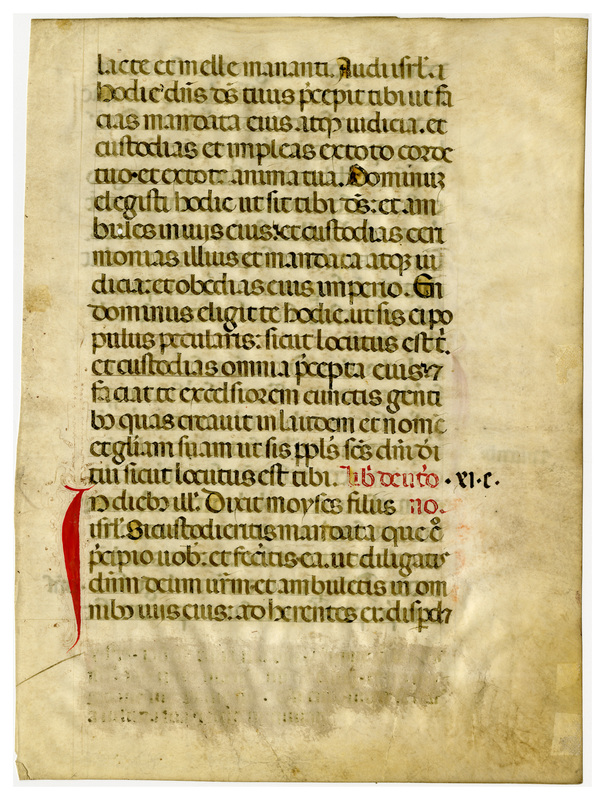 Sometimes, as in this leaf, they had interlinear neumes in red to assist the deacon or sub-deacon in chanting parts of this section of the church service while he was standing on the second step in front of the altar. The text is written in well executed rotunda gothic script with bold Lombardic initials. Some of the filigree decoration which surrounds the initial letters has faded because it was executed in some of the fugitive colors which were then prepared from the juices of such flowers and plants as tumeric, saffron, lilies, and prugnameroli (buckthorn berries). First letters are filled with yellow. The top margin has been trimmed, and some leaves show extensive erasure. Text: Deuteronomy 26:9; 26:16-19; 11:22-23 (recto); Deuteronomy 11:23-25; 2 Maccabees 1:23; 2 Maccabees 1:2-5 (verso). Reconstruction Note: In Ege's original manuscript, this leaf was followed by what is now Leaf 37 in the Kenyon College portfolio. [Deuteronomy 26:16-19] This day the Lord thy God hath commanded thee to do these commandments and judgments: and to keep and fulfil them with all thy heart, and with all thy soul. 17 Thou hast chosen the Lord this day to be thy God, and to walk in his ways and keep his ceremonies, and precepts, and judgments, and obey his command. 18 And the Lord hath chosen thee this day, to be his peculiar people, as he hath spoken to thee, and to keep all his commandments: 19 And to make thee higher than all nations which he hath created, to his own praise, and name, and glory: that thou mayst be a holy people of the Lord thy God, as he hath spoken. The Book of Deuteronomy. 11.c. [Deuteronomy 11:23-25] The Lord will destroy all these nations before your face, and you shall possess them, which are greater and stronger than you. 24 Every place, that your foot shall tread upon, shall be yours. From the desert, and from Libanus, from the great river Euphrates unto the western sea shall be your borders. 25 None shall stand against you: the Lord your God shall lay the dread and fear of you upon all the land that you shall tread upon, as he hath spoken to you. The Lord our God. [ ] Books of the Maccabees. [2 Maccabees 1:23] In that time. 23 And all the priests made prayer, while the sacrifice was consuming, Jonathan beginning, and the rest answering. lacte et melle manántem. Audi Israel. Hódie Dóminus Deus tuus præcépit tibi ut fácias mandáta hæc atque judícia: et custódias et ímpleas ex toto corde tuo, et ex tota ánima tua. Dóminum elegísti hódie, ut sit tibi Deus, et ámbules in viis ejus, et custódias cæremónias illíus, et mandáta atque judícia, et obédias ejus império. Et Dóminus elégit te hódie ut sis ei pópulus peculiáris, sicut locútus est tibi, et custódias ómnia præcépta illíus: et fáciat te excelsiórem cunctis géntibus quas creávit, in laudem, et nomen, et glóriam suam: ut sis pópulus sanctus Dómini Dei tui, sicut locútus est. Liber Deuteronomie. xi. c.
Dóminus omnes gentes istas ante fáciem vestram, et possidébitis eas, quæ majóres et fortióres vobis sunt. Omnis locus, quem calcáverit pes vester, vester erit. A desérto, et a Líbano, a flúmine magno Euphráte usque ad mare occidentále erunt términi vestri. Nullus stabit contra vos: terrórem vestrum et formídinem dabit Dóminus Deus vester super omnem terram quam calcatúri estis, sicut locútus est vobis. Dominus deus noster. [ ] libri Machabeorum. “E0037 Leaf from an Epistolary (Epistolarium),” Digital Exhibits | Denison University Archives & Special Collections, accessed April 23, 2019, http://exhibits.denisonarchives.org/items/show/57.